A simple tweet by actress Alyssa Milano started a consciousness-raising movement that has set social media ablaze with women stepping forward to say, “#MeToo”. On Sunday, 15 October 2017, the Charmed actress took to Twitter to ask followers to reply “me too” on her tweet if they have been sexually harassed or assaulted. An astounding 64K+ individuals (women and men) replied with the two words, shared their experiences or voiced their support for the movement. As if the engagement with that post wasn’t enough, the tweet sparked a social media trend that has flooded online channels. Claims against public male figures such as Harvey Weinstein, Donald Trump, Bill Cosby, Roger Ailes and Bill O’Reilly that have been exposed in the recent past were popular themes in driving online mentions but experiences with family members, bosses or partners have also surfaced. 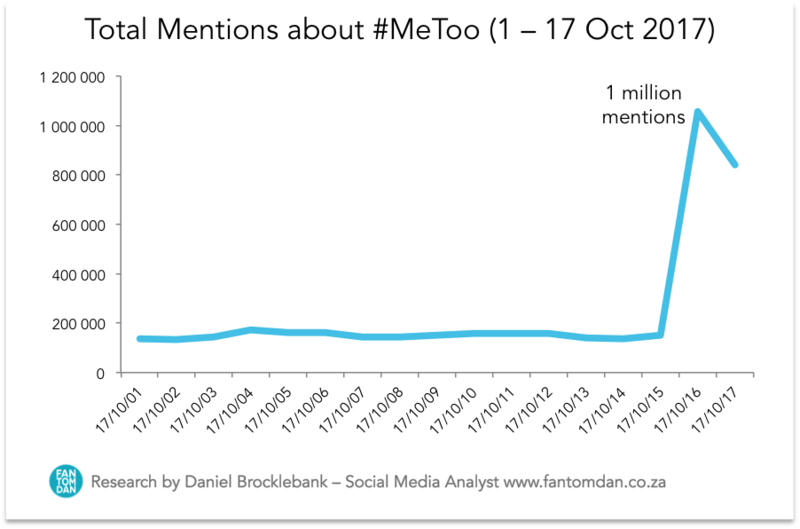 There were over 4 million mentions during October (until the 17th), 26% of which occurred on 16 October. Females made the most considerable contribution to volumes, however, 29% of mentions were by males. Social media was the preferred medium for sharing. The majority of mentions stemmed from Twitter, followed by Tumblr and Instagram. 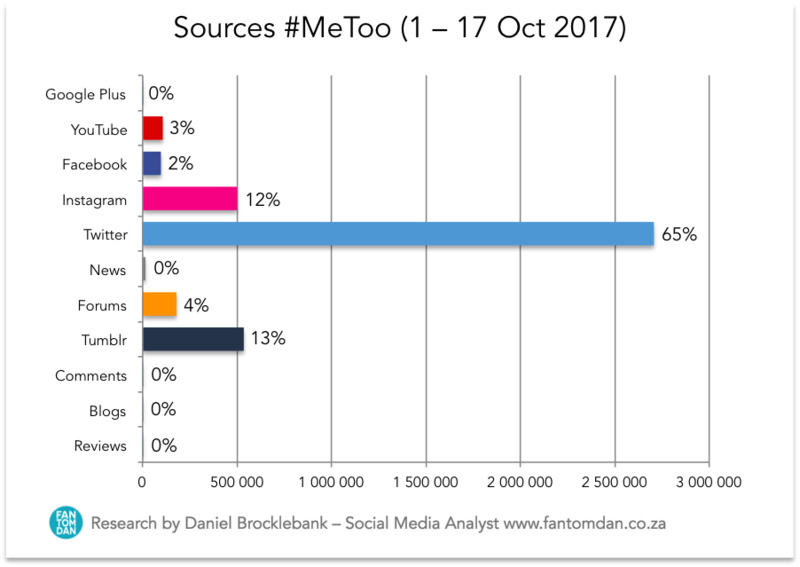 As expected, the most used hashtag was #MeToo with 1,2 million mentions, followed by #NoMore and #WomenWhoRoar with 14K+ and 10K uses respectively. 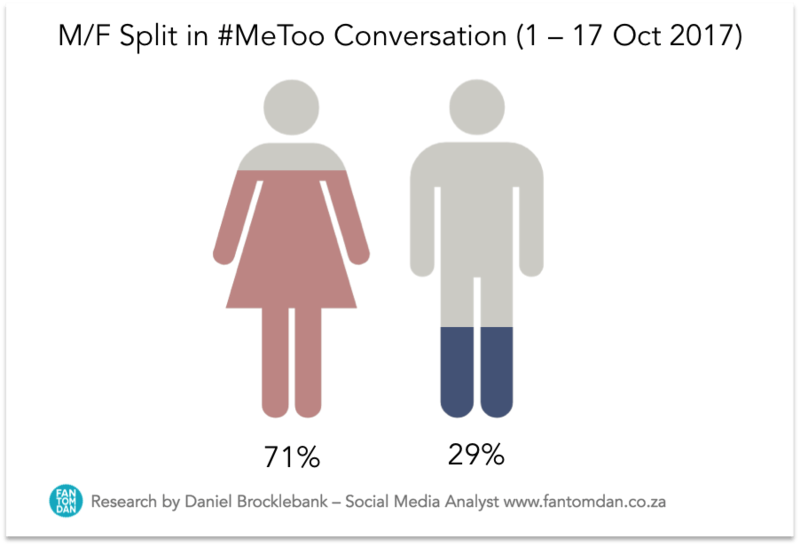 The volumes and support generated from this trend are staggering with several celebrities and organisations adding to the conversation. Reminder that if a woman didn't post #MeToo, it doesn't mean she wasn't sexually assaulted or harassed. Survivors don't owe you their story. Say you have a father, a brother, a son who can do better. For those carrying their #MeToo with them silently, you are loved, cherished, and believed. You do not owe your story to anyone. Let’s hope this movement brings about real change in law and culture.